Tag line: "The Greatest Adventure a Man Ever Lived!" 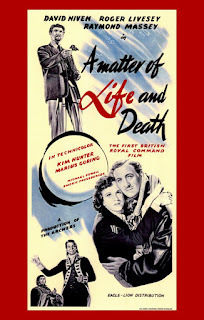 Equal parts fantasy and romance, 1946’s A Matter of Life and Death, which sprang from the creative minds of Michael Powell and Emeric Pressburger, is a wildly imaginative motion picture that, in one fell swoop, will challenge your brain, tug at your heart strings, and excite your senses. May, 1945. A heavily damaged bomber is returning from Germany, and its pilot Peter Carter (David Niven), left alone after the rest of his crew bailed out, makes radio contact with June (Kim Hunter), a young American servicewoman stationed on the coast of England. In the brief moments they share together, a strong bond forms between the two, but it’s all for naught because Peter, realizing his plane is about to crash, has no parachute (it was damaged by shrapnel), and must leap from his speeding aircraft into the unforgiving English Channel below. Convinced he’s reached the end of the line, Peter declares his love for June and jumps. But, to Peter surprise, he doesn’t die as expected. Instead, he washes up on the beach, where, as luck would have it, he has a chance encounter with June! From the moment their eyes meet, Peter and June know they’re meant to be together, and spend the entire day in each other’s company. As it turns out, though, fate had, indeed, marked Peter Carter for death, but Conductor 71 (Marius Goring), the angel sent to collect his spirit, lost Peter when he leapt from the plane and disappeared in the fog. When confronted by Conductor 71 and told that heaven is expecting him, Peter argues that his situation has changed, and he’s not the same person he was a day earlier. Now a man in love, he feels he should be allowed to continue living, if not for his sake, then for June’s. Due to these extenuating circumstances, Peter is granted the opportunity to defend his life in a heavenly court, and, with the help of Conductor 71, he begins to assemble his case. But is Peter truly on trial, or, as his physician Dr. Reeves (Roger Livesey) contends, is he suffering a trauma to the brain that’s causing him to hallucinate? Either way, June and Dr. Reeves know that time is of the essence, because whether the trial is real or not, Peter believes it is, and should the “ruling” go against him, he will most likely die. From start to finish, A Matter of Life and Death (retitled Stairway to Heaven for its U.S. release) is a dazzling motion picture that combines rich technicolor (the “real” world) with stunning black and white (in an interesting twist, all of the scenes set in heaven are presented in monochrome). In addition, the movie boasts some incredible set pieces; while in heaven, waiting for Carter to arrive, his co-pilot Bob Trubshawe (Robert Coote), who was killed in the attack, peers down through a large opening into the hall of records (which, considering it contains the names of every deceased person since the beginning of time, is quite huge). The most amazing scene, however, has Peter and Conductor 71 riding an “escalator” to heaven that is lined with statues of history’s greatest thinkers (during the trip, they discuss which of these famous minds Peter should choose to serve as his defense council). These scenes, and several others (including Peter’s trial, which takes place in an area large enough to seat thousands upon thousands of spectators), help make A Matter of Life and Death a remarkably vibrant visual experience. But like other Powell / Pressburger collaborations (Black Narcissus, The Red Shoes), A Matter of Life and Death is more than a great-looking film. It’s also very moving (the opening scene, where Peter talks with June on the radio as his plane goes down, will bring a tear to your eye), incredibly romantic (thanks to Niven and Hunter, both of whom are exceptional, we believe that a man and woman can fall helplessly in love in a few hours’ time), and extremely smart. During Peter’s trial, the prosecuting attorney, Abraham Farlan (Raymond Massey), who was the first American killed in the Revolutionary War, argues that no woman of “Good American Stock” would fall in love with an Englishman, let alone one she’s only just met, while Peter’s attorney (I’ll leave his identity a surprise) counters that love knows no physical boundaries, and that his client's current situation necessitates that he be granted a new “due date” in heaven, one that’s hopefully many years down the road. The sometimes spirited debate presented in this sequence is fascinating, to say the least, and will leave us to ponder what role love should play when life and death are on the line. Clever, touching, and oh so beautiful, A Matter of Life and Death is more than Powell / Pressburger’s finest film, it’s also one of the best movies of the 1940’s. If you are seeing it for the first time, know that I’m envious; you’re in for one hell of a treat!